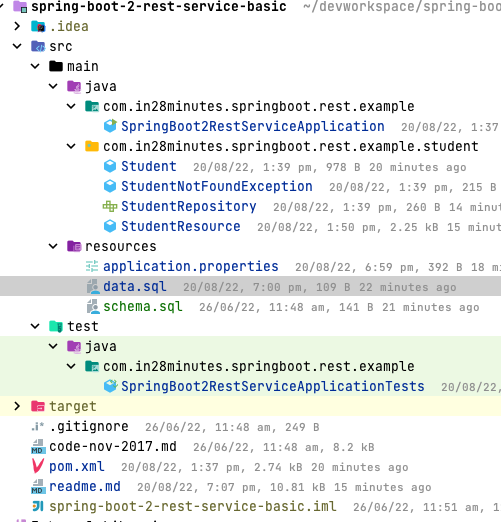 This guide will help you implement Content Negotiation for a REST API/Service with Spring Boot. Content Negotiation helps the Consumer and Provider interact about the data exchange format. In this article, we will expose both XML and JSON representations. Why do you need Content Negotiation? How do you implement Content Negotiation with Spring Boot? How do you use XML representation for request and response with Spring Boot RESTful Services? How do you use JSON representation for request and response with Spring Boot RESTful Services? Key abstraction in REST is a Resource. There is no restriction on what can be a resource. A todo is a resource. A person on facebook is a resource. When a resource is requested, we provide the representation of the resource. Accept indicates the expected content type of the response. Following screenshot shows how you can specify these headers in a request using Postman. The server is expected to respond based on the Accept header. For example, if a consumer sends a request to http://localhost:8080/students/10001 with Accept header as ‘application/xml’, we need to provide the xml representation of the resource. If a consumer sends a request with Accept header as ‘application/json’, we need to provide the JSON representation of the resource. Similar concept applies to the Response Body Content based on the Content-Type. A consumer can send a POST request to http://localhost:8080/students with Content-Type header as ‘application/xml’, and provide the XML representation of the resource to be created. A consumer can also send a POST request to http://localhost:8080/students with Content-Type header as ‘application/json’, and provide the JSON representation of the resource to be created. This dialogue which happens between the Consumer and Service Provider is called Content Negotiation. We will use the same example to discuss about Content Negotiation. Let’s execute a few requests to discover that content negotiation is not provided by default by the project we created with Spring Boot Starter Web and move on the adding content negotiation to our application. Send a request to http://localhost:8080/students/10001 with Accept header as ‘application/xml’. You are expecting to get an XML representation of the resource. However you would get a response with status -> 406 Not Acceptable. This indicates that application does not support providing a response with content type ‘application/xml’. However if you send a request to http://localhost:8080/students/10001 with Accept header as ‘application/json’, you would get the response back as expected. Its simple. All that you would need to do is to add a simple dependency to your pom.xml. Cool! Your application now supports both XML and JSON representations of the student resource. Accept indicates the expected content type of the response for GET requests.